Restaurant Deals: Wendy's, Papa John's and More! Restaurant Deals: Wendy’s, Papa John’s and More! 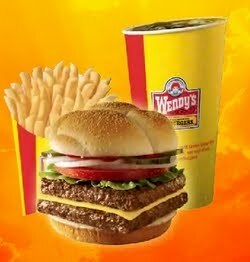 There’s a new Wendy’s coupon available: save $1 on ANY Wendy’s Combo Meal: IE or FF. Please note that this coupon will most likely state you’ve already printed it. If that’s the case, then on the next screen there should be an option to enter a friends email address-enter yours and you should get a working link to the coupon! Become a fan of Papa John’s on Facebook and you’ll get a coupon code for a free medium pizza with any online order of $10 or more! I posted about this Denny’s coupon previously, but wanted to remind you all to make use of it! Get a free burger and fries when you purchase a burger and fries and 2 beverages! This coupon is valid through 11/23/09. Become a fan of Denny’s on Facebook and stop in by Friday (11/6) with this printable coupon to get a free Better Burger when you order a Better Burger. Thanks, Hip to Save and Coupon Cravings!